Understanding what type of boiler system is currently installed into a property doesn’t have to be difficult. Viva Gas has simplified the main points so that the correct system can be installed in relation to the space available, flow rate and the amount of bathrooms the system feeds (see our new boiler installation page). A combi boiler is a single compact unit that supplies both heating and hot water. How does a combination system work? A combi boilers heats water over a heat exchanger directly from the cold mains at mains pressure, if you have good mains pressure you will benefit from a power shower experience. A combi boiler is always on standby hence hot water is always available 24/7. Unfortunately the combi boiler system cannot provide hot water and central heating simultaneously; priority is always given to the source to tap in the first instance. A regular boiler requires a hot water cylinder and a cold water tank in the loft. 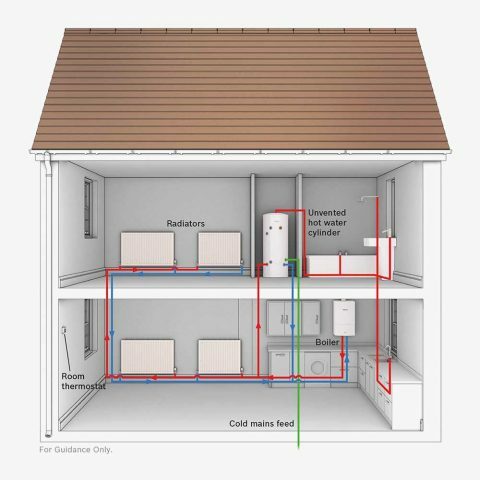 How does a regular boiler system work? Heated water which is stored in large cylinders or tanks is fed directly to outlets or a central heating system, because the water is stored there should be no loss of pressure when running sources (central heating or taps) simultaneously. There are 2 types of regular systems; unvented and vented. An unvented hot water system operates under mains pressure so no cold water header tank is necessary. A vented system is a condensing open vent boiler system (see general points). 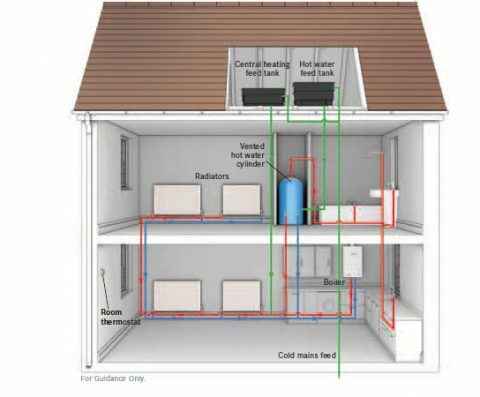 A large amount of space is required in a loft for a regular boiler installation as a hot water cylinder and cold water tank is always required. Hot water stock does need replenishing which can take between 60-80 minutes to reheat. A System boiler which has a hot water cylinder built into the boiler itself. How does a System boiler system work? System Boilers are similar to regular boilers apart from, an expansion vessel and a pressure release valve is included in the boiler components. The pressure release valve is used to release water if the pressure gets too high. 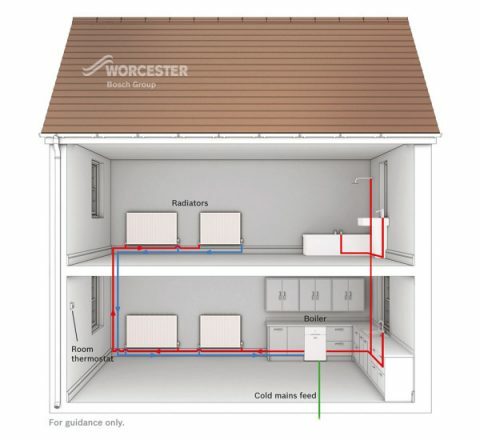 A system boiler does need an insulated hot water cylinder installed in the loft; the cylinder is insulated so heat from the tank does not escape. The boiler does need to be accessible hence the boilers are usually placed in large cupboards. Once the tank of hot water has been utilised there is a wait time until the boiler produces hot water again, this depends on the timer settings on the system installation.